Glaciers have played an important role in the shaping of landscapes in the middle and high latitudes and in alpine environments. Their ability to erode soil and rock, transport sediment, and deposit sediment is extraordinary. During the last glacial period more than 50 million square kilometers of land surface were geomorphically influenced by the presence of glaciers. Two major erosional processes occur at the base of a glacier. First, at the base of a glacier, large amounts of loose rock and sediment are incorporated into the moving glacial ice by partial melting and refreezing. The second process of erosion involves the abrasive action of the held rock and sediment held by the ice on the surface underneath the glacier. This abrasive process is known as scouring. Scouring creates a variety of features. The most conspicuous feature of scouring is striations. Striations appear as scratches of various size on rock surfaces. In some cases, abrasion can polish the surface of some rock types smooth. This geomorphic feature is known as glacial polish. The abrasive action of scouring also produces a fine clay-sized sediment that is often transported away from the glacier by meltwater. As a result of this process, glacial meltwater can have a light, cloudy appearance, and is called glacial milk. Glacial striations, Lac Blanchet, Canada. (Source: Natural Resources Canada – Terrain Sciences Division – Canadian Landscapes). The second major erosional process that occurs at the base of a glacier is plucking. Plucking is the process of particle detachment by moving glacial ice. In this process, basal ice freezes in rock surface cracks. As the main body of the glacial ice moves material around the ice in the cracks is pulled and plucked out. The intensity of the plucking process is greatest on the lee-side of rock mounds. When combined with glacial abrasion, the action of plucking on rock mounds produces a unique asymmetrical feature known as roche moutonnee. Roche moutonnee are smooth on the side of ice advancement and steep and jagged on the opposite side. Glaciers generally flow over the land surface along a path of least resistance. 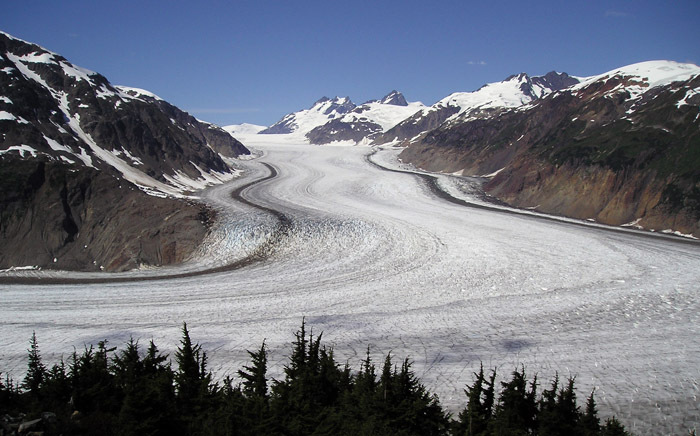 The flow of an alpine glacier into a valley, causes the glacier to rapidly advance producing a swollen tongue of ice at the glacier’s snout, known as a lobe. As the lobe movesdown the valley it often encounters the lobes of other glaciers from connecting valleys. The glacier grows in size with addition of the flow of connected sub-valleys. 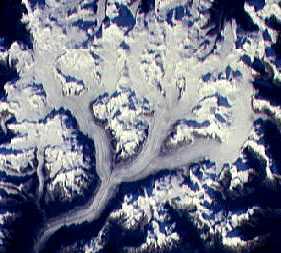 The following image illustrates one of these networks of connectedalpineglaciers . Merging alpine glaciers viewed from above (Source: NASA). A number of distinct erosional features can be observed in mountainous regions that have experienced the effects of glaciation. Much of this erosion is exerted on the bottoms and sides of alpine valleys that guide the flow of glaciers. 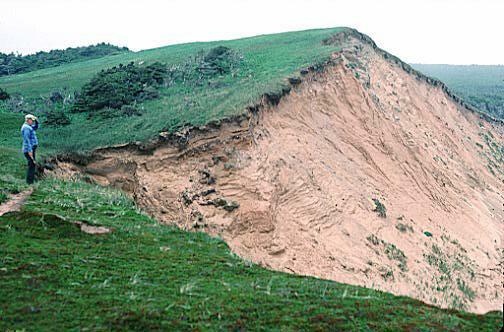 This erosion causes the bottom and the sides of any glaciated valley to become both wider and deeper over time. Glacial erosion also results in a change in the valley’s cross-sectional shape. Glacial valleys tend to have a pronounced U-shape that contrasts sharply with V-shape valleys created by stream erosion. Small adjoining feeder valleys entering a large valley in a glaciated mountainous region tend to have their floors elevated some distance above the level of the main valley’s floor. Geomorphologist call this landform a hanging valley. Hanging valleys develop because of two reasons: 1) larger, more massive glaciers create greater erosion and subsequently a deeper valley, and 2) some valleys have seen more glacier ice pass through them which also results in more erosion and a deeper valley. Many hanging valleys are also the sites of sensational waterfalls. 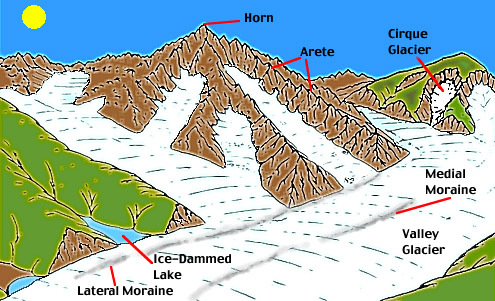 Some of the other features associated with glacier erosion in alpine regions are cirques, horns, and arêtes . Cirques are the bowl shaped depressions found at the head of glacial valleys. For most alpine glaciers, cirques are the areas in the alpine valleys where snow first accumulated and was modified into glacial ice. The glaciers that occupy cirques are called cirque glaciers. Horns are pyramidal peaks that form when several cirques chisel a mountain from three or more sides. The most famous horn is the Matterhorn found in the Swiss Alps. Arêtes are the narrow serrated ridges found in glaciated alpine areas. Arêtes form when two opposing cirques back erode a mountain ridge. Features associated with alpine glaciation. Talusand otherfoot-slope deposits are also common in a glaciated valley. Because of the enhancement of freeze-thaw processes bedrock in alpine areas is weathered by the growth of ice crystals. This type of weathering shatters the bedrock into sharp angular fragments that accumulate at the bottom of rock slopes as talus. Much of the debris carried by an alpine glacier comes from valley sides where talus accumulates. The erosional landforms produced by continental glaciers are usually less obvious than those created by alpine glaciers. Like alpine glaciers, the movement of continental glaciers followed topographic trends found in the landscape. Continental ice sheets were very thick, between 1000 to 3000 meters. The mass of these glaciers covered all but the highest features and had extremely strong erosive power. 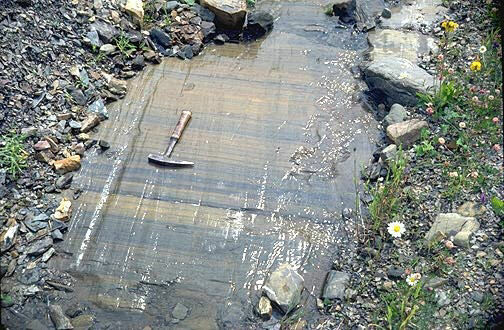 Much of the Canadian Shield shows the effects of abrasion and gouging which created glacial polish and striations on bedrock surfaces. In some areas, continental ice sheets produced huge U-shaped valleys from previously V-shaped stream valleys. In other areas, erosion by the continental ice sheets scooped out large shallow basins, many of which exist today as lakes. Many of the lakes on the Canadian Shield, including those of the Great Lakes, were created by glacial erosion. A large part of the surface of a glacier is covered with a coating of sediment and rock debris. This is especially prevalent near the snout of the glacier, where most of the ice has been lost to ablation and sediment is left behind. Sediment is added to glacial ice in two ways. Large quantities of sediment are picked up by abrasion and plucking at the base of the ice. In alpine areas, sediment is added to the surface of the glacier from the valley walls through various types of mass movement. Much of the debris that is added to the ice of the glacier is eventually delivered to the snout because of the continual forward flow of glacial ice. From the snout this material can be placed directly from the ice or it can be deposited through the action of flowing meltwater. Geomorphologists call the later deposits glaciofluvialdeposits. The technical term used to describe material deposited by the ice is called till or moraine. All glacial deposits are by and large known as glacial drift. Till is a heterogeneous combination of unstratified sediments ranging in size from large boulders to minute particles of clay. When till is deposited along the edge of a glacier it tends to form irregular hills and mounds known as moraines. A terminal moraine is a deposit that mark, the farthest advance of a glacier. Moraine deposits created during halts in the retreat of the glacier are called recessionalmoraines. The debris that falls from valley side slopes can be concentrated in a narrow belt and cause a deposit known as a lateral moraine . 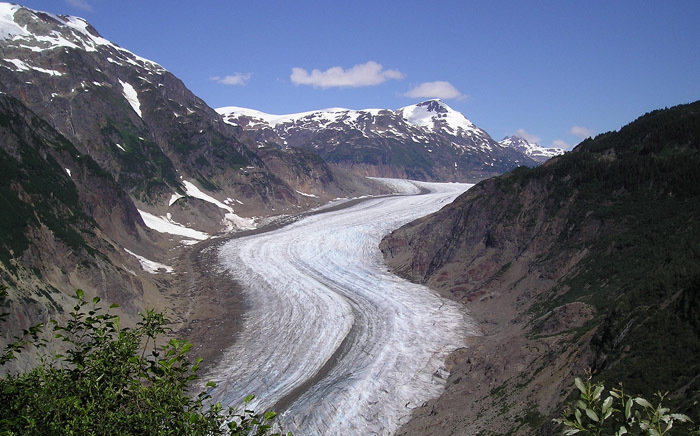 When two glaciers flow together, two lateral moraines can merge to form an interior belt of debris, called a medial moraine . A till plain is a large, relatively flat plain of till that forms when a sheet of ice becomes detached from the main body of the glacier and melts in place. Sometimes the sediments in a till plain can contain large boulders. If these boulders are transported a great distance from their place of origin, they are called erratics. Lateral moraines along the sides of the Salmon Glacier, British Columbia, Canada (Photo © Trudy Kavanagh). Medial moraine down the center of the Salmon Glacier, British Columbia, Canada (Photo © Trudy Kavanagh). 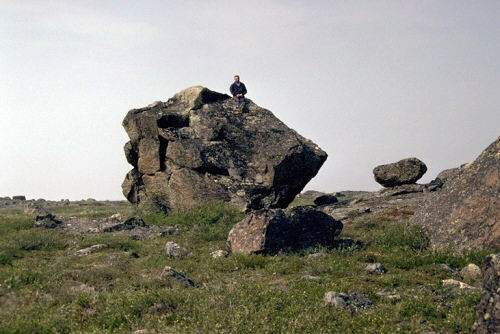 Glacial erratic near Point Lake, Northwest Territories. Glacial erratics are large pieces of rock that have been transported away from their source areas by moving glacial ice sheets. (Source: Natural Resources Canada – Terrain Sciences Division – Canadian Landscapes). Glaciofluvial deposits are generally quite stratified and less sorted in terms of particle size. Outwash deposits are formed when sand is eroded, transported, and deposited by meltwater streams from the glacier’s snout and nearby till deposits to areas in front of the glacier. Outwash plain develops when there are a great number of meltwater streams depositing material ahead of the glacier . 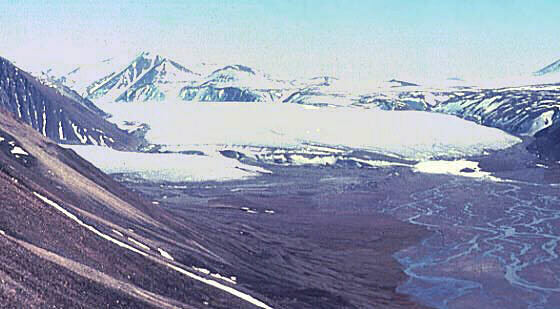 Glacier snout and outwash plain, Bylot Island, Canada. (Source: Natural Resources Canada – Terrain Sciences Division – Canadian Landscapes). Glaciofluvial deposits are also associated with the melting of stagnant ice at the front of the glacier. Where sediment rich water flows into a crevasse or depression in the ice, a conical-shaped pile of sand and gravel, known as a kame, can form (Figure 10af-8). Many kames are often found on or at the edge of moraines. Kame, La Bluff, Ile de la Grande Entree, Canada. This kame was deposited during the main stage of the last glaciation when the Laurentide ice sheet filled the Gulf of St. lawrence. (Source: Natural Resources Canada – Terrain Sciences Division – Canadian Landscapes). Glaciers can also contain sinuous flows of meltwater that occur in ice tunnels at the base of the ice. The beds of these sub-surface glacial streams are composed of layers of sand and gravel. When the ice melts from around the meltwater tunnels, the beds of sand and gravel are deposited on the Earth’s surface as long twisting ridges known as eskers (Figure 10af-9). 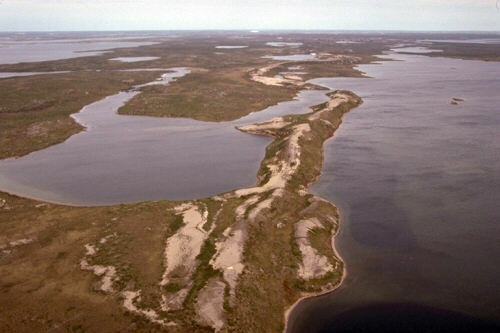 Esker near Lac du Sauvage, Northwest Territories. The slightly curving thin ridge in the centers of this photo is the esker. The flat region in the foreground to the left of the esker was formed by glacial outwash. (Source: Natural Resources Canada – Terrain Sciences Division – Canadian Landscapes). Another feature of continental glaciation are hill shaped deposits of till known as drumlins . Drumlins often occur in large numbers across areas of New York and Wisconsin, USA and Ontario, Canada. The streamline shape of these glacial features resembles a extended teaspoon laying bowl down. The gently sloping tapered end of the drumlin points in the general direction the glacier traveled. Drumlins also come in a variety of dimensions. Lengths can range from 100 to 5000 meters and heights can sometimes exceed 200 meters. A couple theories exist to explain their formation. The most excepted theory suggests they form when saturated ground sediments oozes up into hollows at the base of an advancing glacier. The sediment is then stretched out and molded into a streamline form as the ice moves forward. Drumlin field in northwestern Manitoba. These features are made of till and are formed at the base of a glacial ice sheet. The long axis of this feature aligns with the direction of glacial movement. (Source: Natural Resources Canada – Terrain Sciences Division – Canadian Landscapes). When glaciers are rapidly retreating, numerous blocks of ice can become detached from the main body of the glacier. If glacial drift is then placed around the ice, a depression on the surface called a kettle holecan be created when the ice melts . Kettle holes are commonly found on moraine and outwash plain deposits. 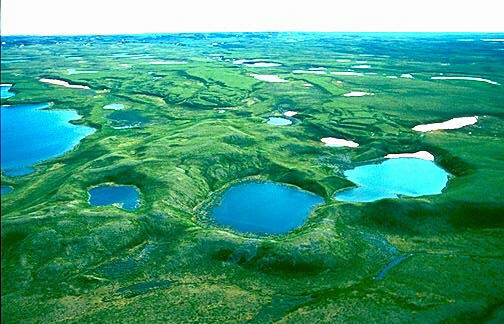 Large kettle holes that reach below the water table can form into lakes. 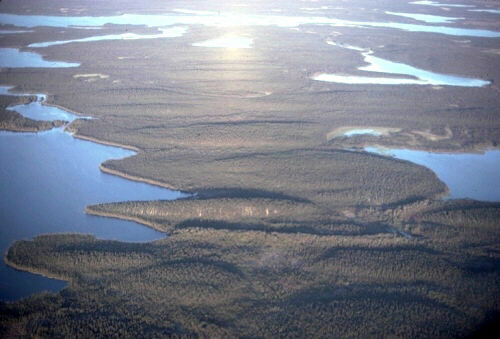 The photograph below shows some kettle lakes in glaciofluvial outwash complex located in the Northwestern District of Mackenzie, Northwest Territories . Some kettle holes develop into wetlands such as bogs, swamps, and marshes. Kettle Lakes, Northwest Territory, Canada. (Source: Natural Resources Canada – Terrain Sciences Division – Canadian Landscapes). This entry was posted in Glaciers, Landforms. Bookmark the permalink.